Bowen Imagery has built lasting and profitable relationships with companies of all types and sizes in a number of diverse industries. Our clients each have their own demands, which we listen carefully to, and respond to with creative and impactful results. Our specialty: big agency creative design, and superb image quality on a time crunch. When the unexpected happens, you need a creative agency partner you can count on. Fast thinking paired with a responsible and good attitude results in effective problem solving–in an area that often demands perfection on a timeline. What to expect: A creative partner that listens carefully to your needs and takes the extra steps necessary to understand your creative and design objectives. 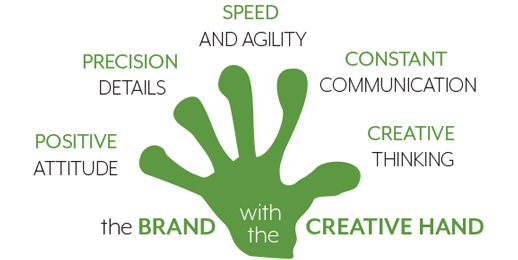 Our collaborative approach and flexible attitude is what makes BIMG – “the brand with the creative hand” so effective, and it’s what keeps our clients coming back to us year after year. Browse through our Case Studies to see the scope and extent of the work you can expect from satisfied clients in a variety of markets. We call ourselves creative specialists, and as specialists in print and layout design, branding, illustration, and photography our goal is to produce superior creative concepts and designs that communicate. We’re here to be your support team by providing our expertise and creating solutions for your business.